Head impacts in sport are analyzed, including 1) concussive impacts in professional football simulated in laboratory tests to determine injury mechanisms 2) neck compression forces with head down impacts by striking players and 3) straight punches to the frangible face of the Hybrid III dummy by US Olympic boxers to determine punch force and head dynamics. Concussed NFL players experienced impacts at 9.3 ± 1.9 m/s velocity with 7.2 ± 1.8 m/s head ΔV. Peak acceleration was 98 ± 28 g over 15 ms. Concussion correlated with translational acceleration. The nominal tolerance for concussion was HIC=250. Impact force was 7191 ± 2352 N with 56.1 ± 22.1 g head acceleration in the striking player and 4221 ± 1885 N neck compression force. Nij was greater than tolerance in 1/3rd of the striking players who had neck compression force of 6614 ± 1006 N and Nij of 1.37 ± 0.25. In boxing, the punch force was 3427 ± 811 N, hand velocity 9.14 ± 2.06 m/s and effective punch mass 2.9 ± 2.0 kg. Punch force was higher for the heavier weight classes, due primarily to a greater effective punch mass. Jaw load was 876 ± 288 N and translational acceleration 58 ± 13 g. In the NFL, concussion occurs with considerable impact velocity and head ΔV due to translational acceleration. Olympic boxers deliver straight punches with similar impact velocity, but the punch mass is much lower, so the head ΔV is considerably less than in football concussions. The role of rotational acceleration in concussion is unclear from these studies. Helmets and padding need to reduce HIC to lower the risk of concussion. Neck compression forces often exceed Nij tolerances in professional football. 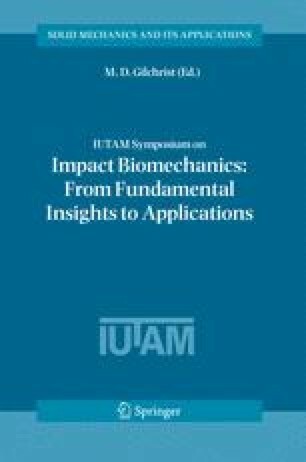 This sports-related biomechanics data is relevant to impact conditions in automotive crashes and the assessment of safety systems.